Si vous cherchez la version française de cet article, elle est ici : Panorama des médias sociaux 2016. 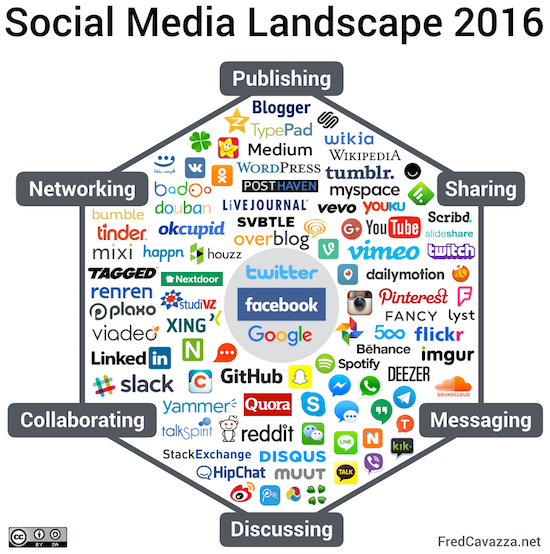 The first version of my Social Media Landscape was published in 2008. Back at this time, the landscape wasn’t very different from what it is now: publishing, sharing, discussing and networking tools (we even begin to witness the come back of livecast tools like Periscope!). Nevertheless, I have published a new version every year, with growing popularity. The reason so many people are interesting in this landscape is because there are always new comers, and because it is very complex to apprehend. Moreover, social media are playing a major role in our daily lives (Facebook users are connected more than 30 minutes per day on average). If originally, social media were designed for conversation and sharing purpose, they evolved into mainstream information / communication / engagement channels. After years of adding new functionalities and buyout, major social platforms like Facebook or Twitter became 21’s century dominant media. No media in the history of humanity ever manage to reach a 1 billion viewers, even CNN or MTV. Today, Facebook already have nearly 1.6 billion members, with more than a billion connecting every day. Facebook’s success is huge, and it’s future is shining, as we can witness it with their 10-year roadmap. Between Facebook.com, Facebook Messenger, Instagram and WhatsApp, Facebook is arguably the web’s new king. Not only it is dominating desktop and mobile audience, but it’s numerous advertising options give it an unprecedented power. This being said, if Facebook managed to build the largest audience, there are as many brands using Twitter than Facebook, while the latest’s audience is 5 times bigger. It looks like size does not always matter, the quality of the audience and interactions must be taken in account. Likewise, if Google+ was a failure, Google’s various social properties are amassing a wide audience (YouTube, Blogger, Communities, Collections…), without mentioning it’s main activities (search, Android, Chrome…). This is why these three players (Facebook, Twitter, Google) have always been at the center of my diagram. If Facebook has increased the gap with its competitors, important efforts have been made in providing new services (publishing tools for articles, video and live streaming). After years of hard labor, Facebook and Google managed to build true conglomerates providing everything users need: content for information and entertainment, services to communicate and share (Pipelines, Platforms, and the New Rules of Strategy). What is true for users is also true for advertisers: from first exposure to in-store tracking, Facebook and Google can provide brands and distributors with end-to-end advertising and relational solutions (The reality of missing out). From this point of view, Facebook and Google has caught up with Yahoo and Microsoft, which where significantly ahead 15 years ago. Even better: Facebook and Google now try to mimic AOL’s model by providing internet access (Facebook.org and Project Fi). I started to include professional social platforms in last year’s landscape, because the line between our professional and personal lives is blurring (mainly thanks to smartphones). 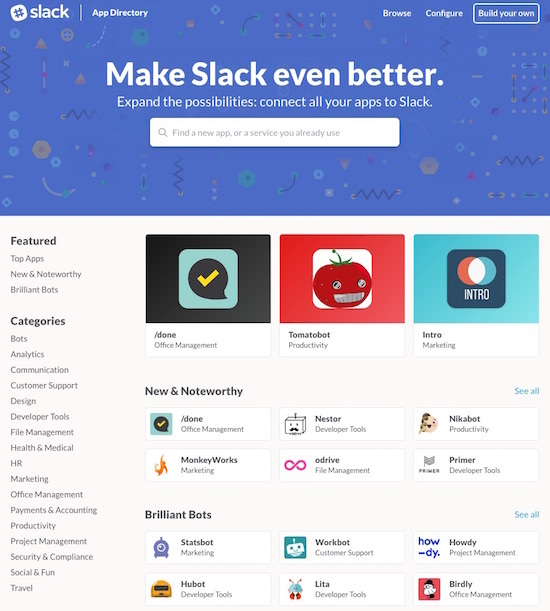 The incredible success of Slack is also a change factor: this service is so useful that we want to continue using it in our daily life. Slack gained so much traction, that it attracted the interest of historical players which are entering the game (Microsoft quietly launched a Slack competitor et WeChat’s competitor to Slack has arrived). It’s been 4 years now that I use a circle for my diagram. If this shape worked fine for the previous versions, it starts to show its limits with the rise of social messaging platforms. 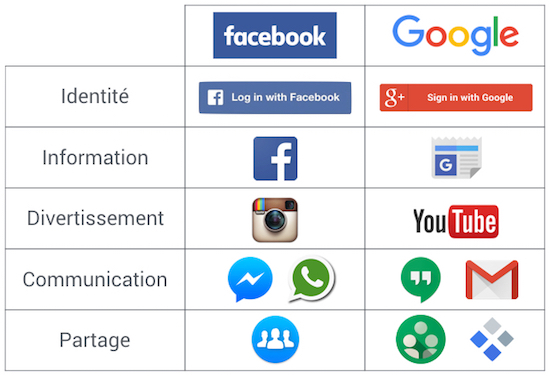 As I explained it earlier, Facebook, Twitter and Google are at the center of this ecosystem. Not only these three companies own the most popular services, but they create a virtuous circle by extending the reach of content and discussions. So no, I don’t envision a near future where Facebook is the only remaining social destination. I strongly believe this oligopoly will perpetuate, with three dominant players and multiple services orbiting around them, because they appeal to a particular audience (ex: Snapchat for teens) or a particular service (ex: Twitch for live gaming). Professional social networks (LinkedIn, Viadeo, Xing, Plaxo…), niche social networks (Ning, Nextdoor, Houzz…), western and eastern mainstream social networks (Tagged, StudiVZ, VKontakte, Odnoklassniki, Facenama…) as well as asian one (Qzone, RenRen, Mixi, Kaixin001, Douban, Pengyou…), and last but not least, dating servies (Badoo, OKcupid, Tinder, Bumble, Happn…). As you can see, this diagram is stacked with numerous services from all over the world. Yes indeed, China is a particular market, but I think it is important to remind you that social media is not only about Facebook or Google, there are many local players. The most notable fact is the relentless rise of social messaging platforms, especially the ones owned by Facebook (Messenger and WhatsApp process 60 billion messages a day, three times more than SMS). There as been so many announcements in the last weeks that we begin to wonder if Messenger is becoming Facebook’s main social property: Facebook Tests SMS Integration In Messenger, Launches Support For Multiple Accounts, Facebook pushes businesses to Messenger with new tools for Pages, Facebook launches Messenger platform with chatbots, Facebook starts allowing “Sponsored Messages” ads, Facebook Messenger launches group calls… Only time will tell if social messaging is the next big thing, the one which will gather all users’ attention (Chat bots, conversation and AI as an interface), but everything is in place to welcome brands and advertisers (How chatbots will recast customer service for brand marketers). If you are looking for alternative diagrams, I shall recommend the Social Media Map, the World Map of Social Networks or the Conversation Prism. A reblogué ceci sur Blockchain Site und DAPPs Sammler . Wow! Such a great resource. Thank you.